It all started in the late 1990�s (you DO remember the 90�s, right?) when VW debuted the New Beetle. One of the first to ride the retro wave, the �New� Beetle was an instant hit and paved the way for a new generation of Volkswagens (and Audis, to a certain extent) featuring the �NB�s� classic arch styling. We got a new Golf, new Jetta, and new Passat all within a matter of months. All featured sleek, simple styling and top-notch interiors. While some �dubbers might say the suspension dynamics on these new models were tuned a bit soft, the media still proclaimed them more fun to drive than your typical Toyota. Perhaps the biggest part that VW got right was in matching an advertising campaign to these new cars. Anybody remember the �Turbonium� ads? 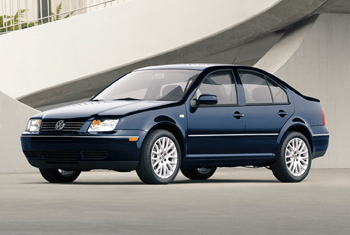 How about the �Synchronicity� Jetta spot? Or the Passat �Envy� ad, where the guy is washing a stranger�s Passat simply because he doesn�t have his own. The �Mr. Roboto� Golf ad is another one that comes to mind. The ads were funny, catchy, and ended up being seen as �hip.� The pasty 20- and 30- somethings often featured in the ads also ended up flocking to the revitalized VW brand, lending a sense of credibility to the ads that would never have come if, say, Lincoln tried the same thing. VW was able to cash in on this cow well into the new millennium, with breakneck sales growth and the youngest average buyers group of any car company. Then the industry hit a rough patch and weaker car companies took to hefty incentives to move vehicles off dealer lots. In the almost three years since 9/11 and GM�s �Keep America Rolling� campaign, things have only intensified. Even strong companies like Toyota and Honda are upping their incentives to compete with the Americans. Volkswagen, on the other hand, held out. They believed their new-found brand cache amongst hipster would lend them some immunity from the incentives disease while keeping sales up. It did allow them to charge a substantial premium over more conservative competitors, after all. There was only one slight problem, trends die, or at least evolve and VW did not. What they sell now, Touareg and Phaeton excluded, are pretty much the same vehicles that they sold when they became the industry darling. So while VW soldiered on with an aging lineup, their competitors launched new models. 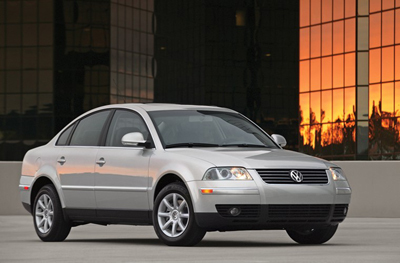 Often, these new vehicles proved that many carmakers were able to crib some of VW�s selling points like plush interiors with trendy lighting, entertaining driving dynamics, and stylish exteriors. They usually undercut VW�s pricing, as well. Let�s all say a collective �Uh-oh� for VW now, class. To give you an idea of how stale VW�s product line has become, Honda will have been able to redesign its Civic twice before VW is able to give us a successor to the current MkIV Jetta. This means VW has been forced to come off of its high horse position of no incentives. The clear evidence is VW�s recent �Drive it. You�ll get it.� campaign, which sounds more like the tagline of a Korean car company than it does the slogan of a former industry innovator. Making matters worse have been a load of quality problems and a consistently weak dealer network. Certainly, VW management has made its mistakes. However, VW could just be battling the symptoms of an increasingly competitive and fickle market. The Hummer H2�s run as media darling lasted a short year before GM had to pay people to drive them off dealer lots. It, along with others like the Mini and the 350Z have already been replaced on the radar screens by vehicles like the Chrysler 300C and Dodge Magnum, and the new Scion brand. Could the car industry just be evolving into something similar to the tech industry where the computer you buy is literally outdated by the time you walk out of the store? It certainly could be a possibility. Onethat means automakers will have to figure out a way to squeeze sales and �hip-status� out of a vehicle within twelve months of its launch (or less) before consumers move on to the next best thing. All I can say is, good luck.